Using the rez box that is part of your purchase from SL-Inspiration is quite intuitive, but the basic steps are demonstrated here, which may be especially useful for anyone who has not used a rez box before. After describing how to rez your building from the rez box I also explain how to configure the elevators for those buildings that have more than one floor. It is strongly recommended that this section is read. 1/ First find the rez box in your inventory and place it on the ground. Raise it a metre or so from the ground to ensure all parts of the building rez correctly. Make sure there is also enough room for the building to rez on your land, as this may also affect how the building will rez. 2/ You will see an arrow on the top of the box. This indicates the direction the building will rez. 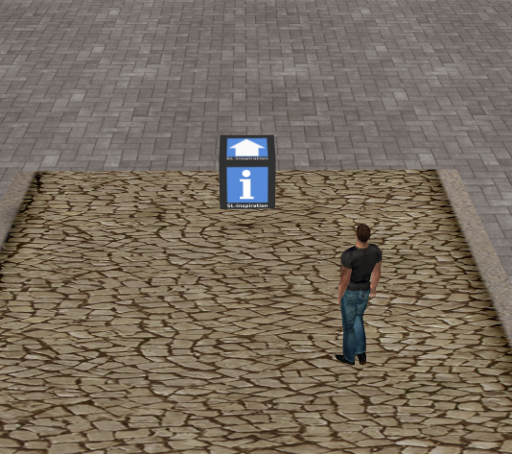 The front of the building will rez a short distance in front of this arrow. 3/ Click the box to show the menu window (shown above). 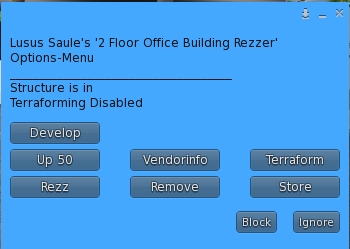 From the menu select Rezz and you building will unpack from the box and rez. 4/ To place the building in its final position right click on the rez box and select edit. Now you can move the box, and the structure will move accordingly. Move the box in small and slow increments to ensure all parts move correctly. 5/ When you are happy with the position of the structure click on the box again and select Freeze from the menu. This will fix the position of the building permanently and remove the rez scripts. The rez box can now be taken back into your inventory. 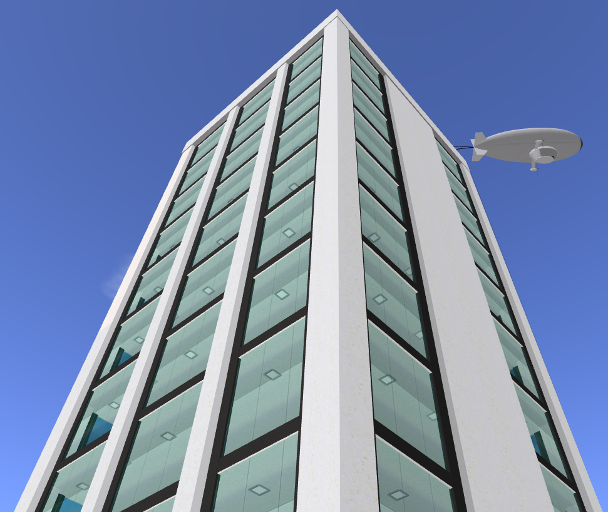 The elevators for each building are already in place, and setting them up so that visitors can teleport to each floor is a matter of adding a few lines for each floor to the Configuration notecard. It is important to remember however that the building should be fixed in its final position and all the rez scripts removed (as explained above), before configuring the elevators. If you set up the elevators then freeze the building, you may find this has affected how the elevators work. If you have already done this, there is a spare elevator included with your purchase which can replace the already positioned elevators if necessary. 1/ Place the Location Finder that came with your building at the landing point for the first elevator. Click the box and a set of co-ordinates will appear in main chat (see below). 2/ From main chat copy the contents of the brackets. 3/ Right click on the elevator and select edit. Then select the contents tab of the edit pane. Double click on the Configuration notecard to open it. 4/ Find the line 'Place1=<0,0,0>', and replace the contents of the brackets by pasting the co-ordinates you copied from main chat, (click on the image above for a clearer view). 5/ Give this location a name such as Ground Floor by replacing 'none' in the 'Placename1' section of the notecard. 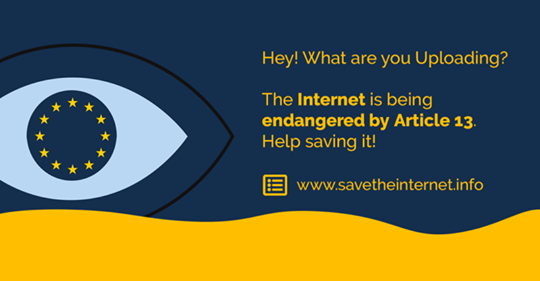 Save the notecard. 6/ Right click on the location finder and select edit again. Move the box up to the next floor and to the next landing point (this will of course involve moving your camera to see what you're doing). 7/ Click the box again so that the next co-ordinates will appear in main chat. Copy them. 9/ Once you have configured the name and co-ordinates for each landing point, you can open the notecard again, then copy its contents. You can now paste the settings to the notecard of the next elevator. 10/ when you are finished you can test your elevators. 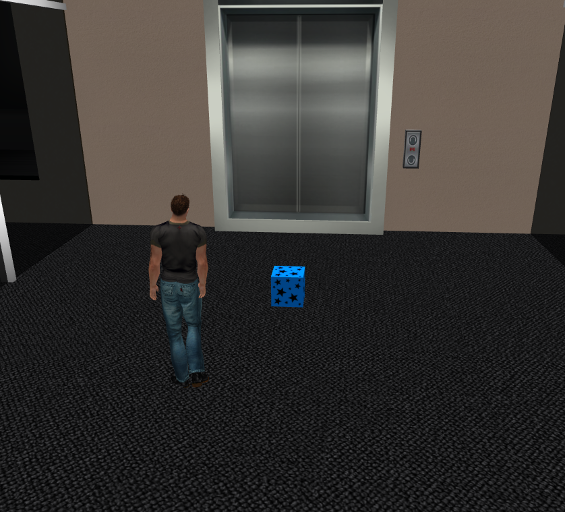 Click on the elevator button and with each click a different floor is selected (you will see the name you gave each floor). When you have the floor you want, right click on the button and select 'Teleport". This will take you to the new floor. Once you are happy with the set up of the elevators you can say '/12 LOCK' in main chat which will lock the co-ordinates you set up in the configuration notecard. Thats all there is to rezzing your structure and configuring your elevators. Enjoy your new purchase, and feel free to contact me with any further questions.